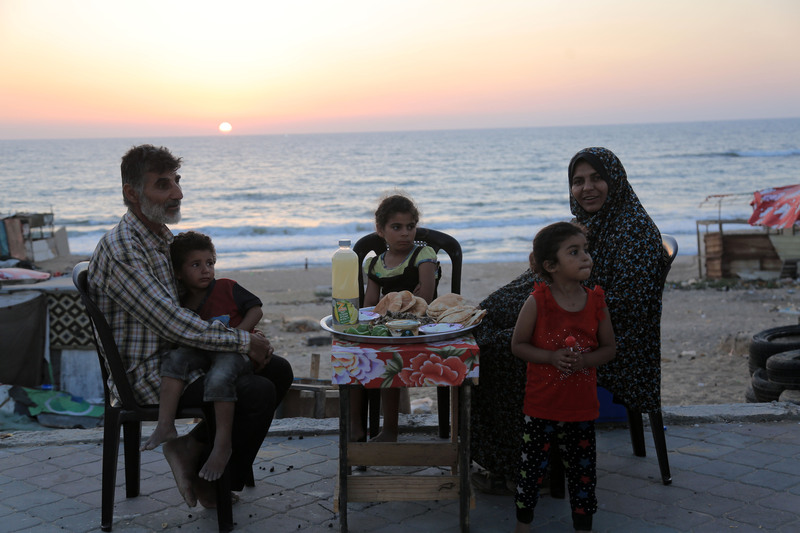 The al-Lahham family gathers for iftar (the meal that breaks the daily Ramadan fast) on the beach front sidewalk outside the tent where they live. The daily iftar ritual helps the family to preserve some sense of normalcy. 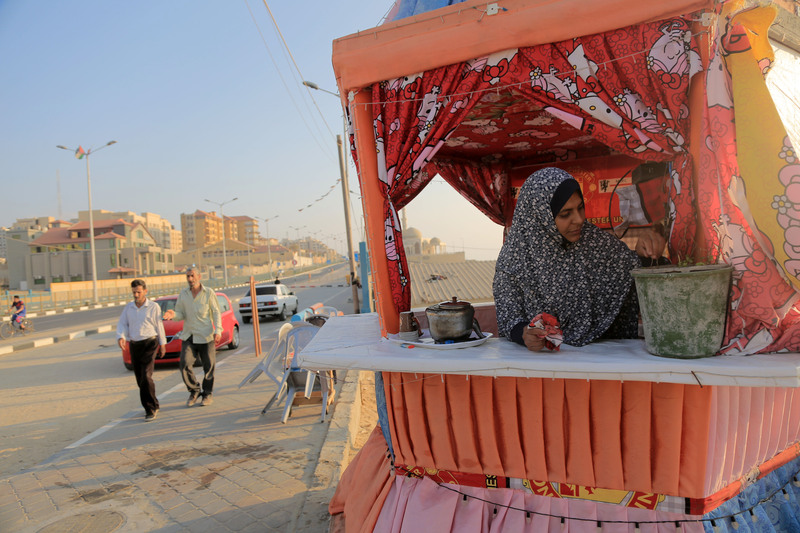 Earlier that afternoon: Umm Ahmad opens the shutters on her seaside tea/coffee shack, so she can prepare the family business before preparing iftar. 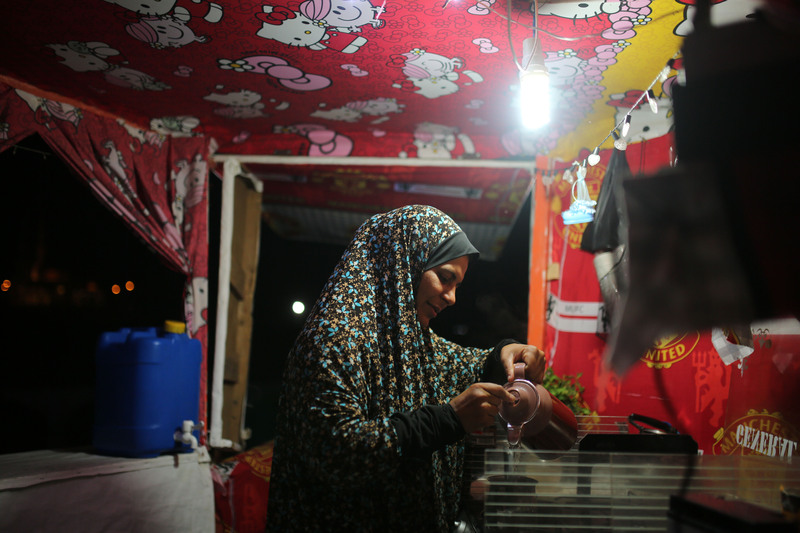 This tea/coffee shack is the family’s only source of income, earning approximately $2.50/day. Umm Ahmad inspects the fresh mint that she will seep in her customers’ tea later that evening. Umm Ahmad, Malak and Ahmad watch potential future customers walk past their tea and coffee shack. It is almost time to prepare their own iftar meal. Umm Ahmad al-Lahham is originally from the West Bank city of Ramallah. 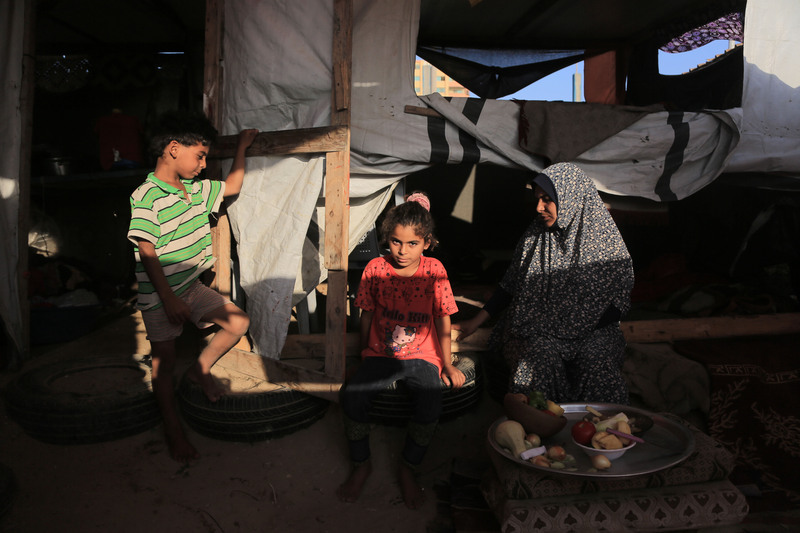 Her parents have died and she has no source of family support in Gaza. The family gazes towards the Mediterranean sea, watching fishermen guide their boats out to sea. 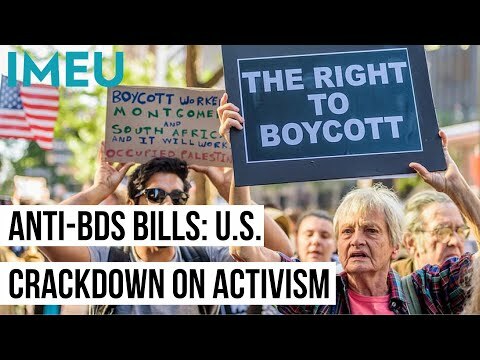 They know that restricted access to fishing waters due to Israel’s naval blockade will make it difficult for the fishermen to make a substantial catch. 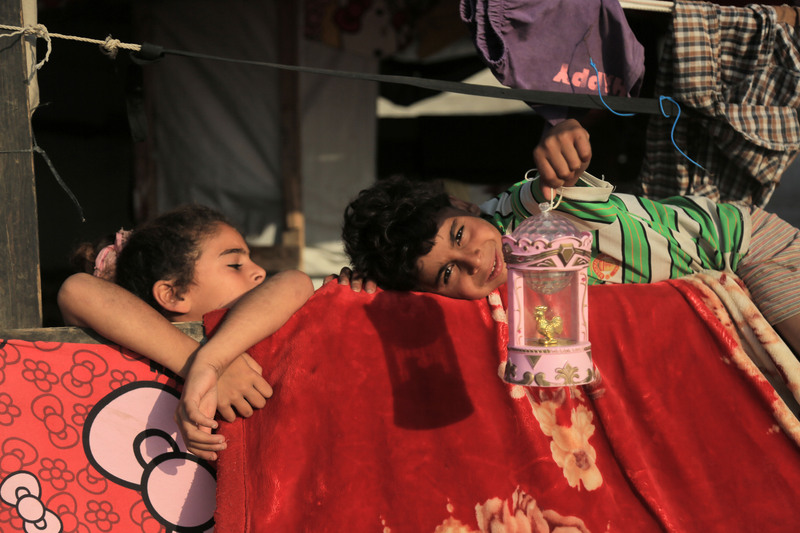 The fanous (lantern) is a symbol of the holy month of Ramadan. A passerby gave Ahmad this fanous when he heard the boy in tears, beseeching his father for one. 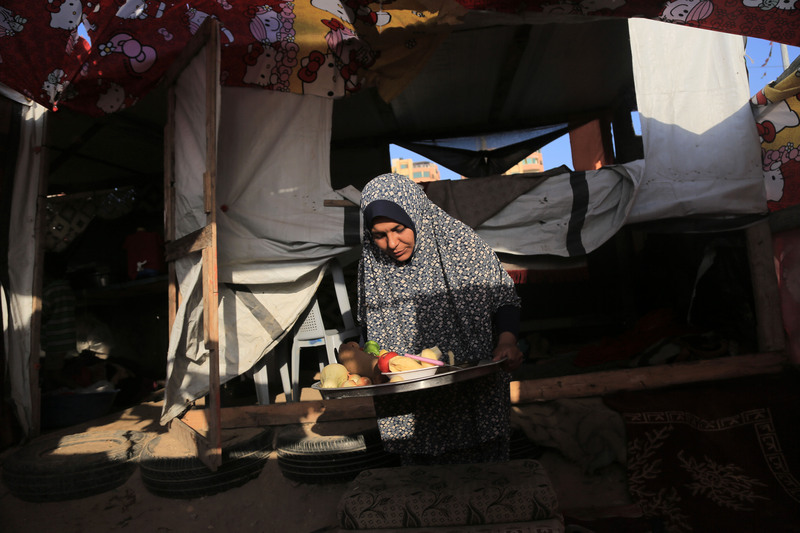 Umm Ahmad prepares iftar inside her tent. 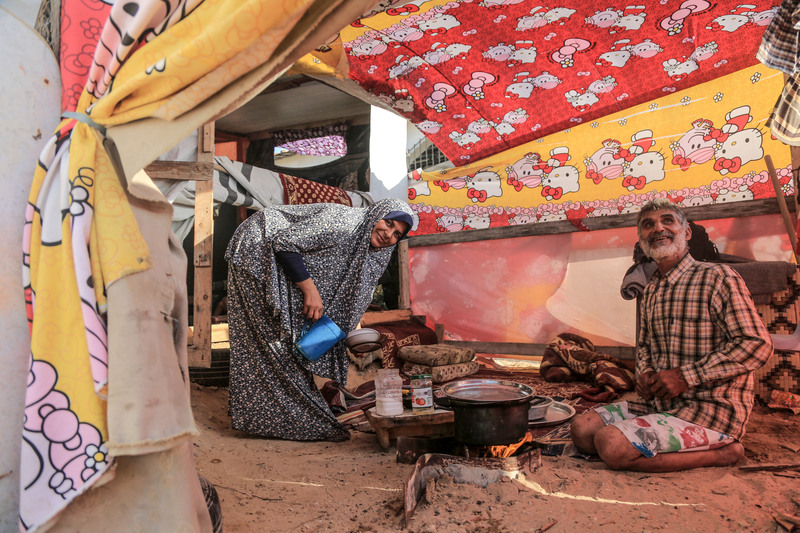 She cooks on scraps of wood that her husband Hani collects from the streets of Gaza. 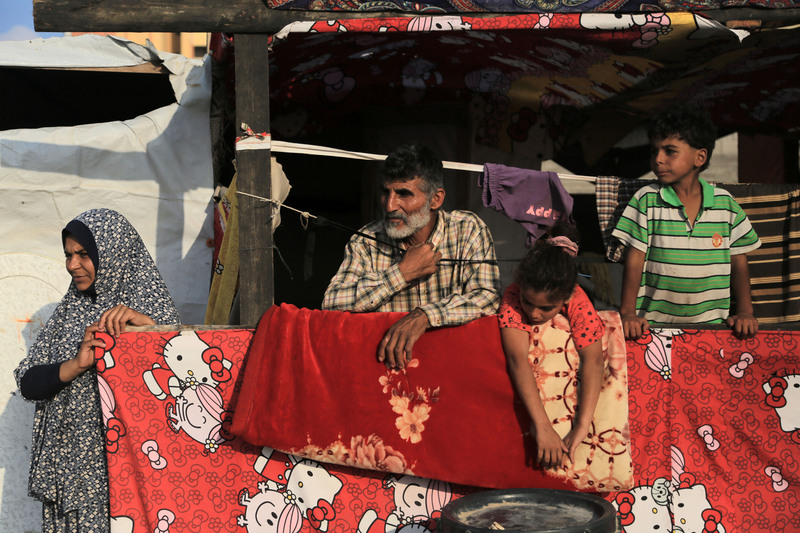 The al-Lahham family has been living in this makeshift tent for three years. Hani peels a potato to be sliced and fried for the upcoming iftar meal as Malak and Ahmad watch with anticipation. Onion, potato, apple and green peppers: key ingredients in the al-Lahham family’s iftar meal. The late afternoon glow of the sun inside the tent is an indication that sunset—and the Ramadan iftar meal—are fast approaching. 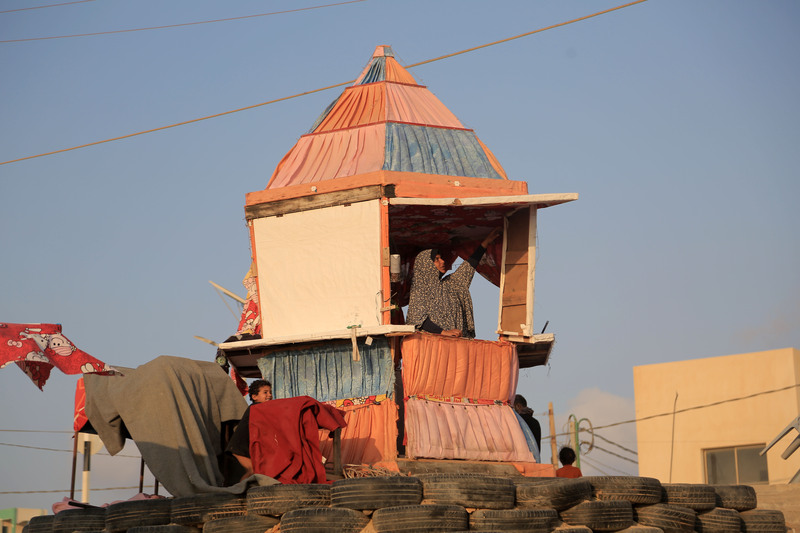 The al-Lahham family notices passersby hurry home before breaking the day’s fast and praying al-Maghrib, the fourth of the five daily prayers in Islam. 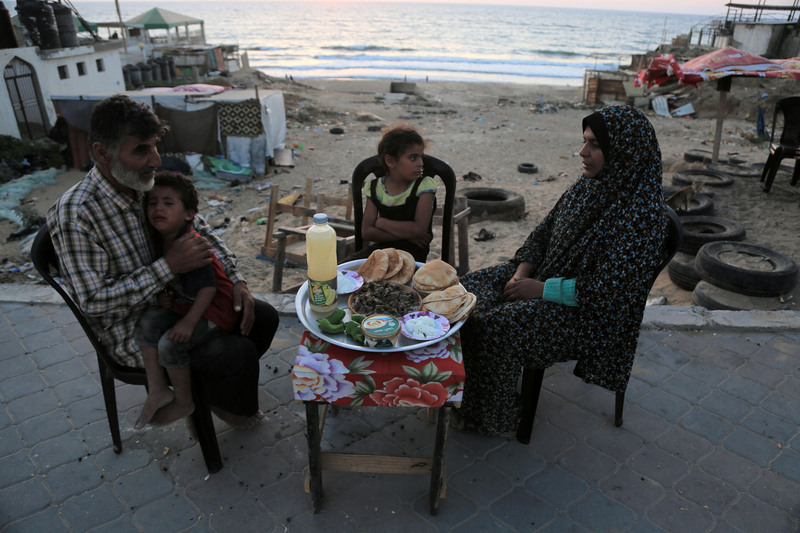 Now that the family, and nearly everyone in Gaza, has eaten ifatr, it is time to offer hot beverages to customers! Umm Ahmad boils water to make coffee. Ramadan brings some hope to the al-Lahham family. 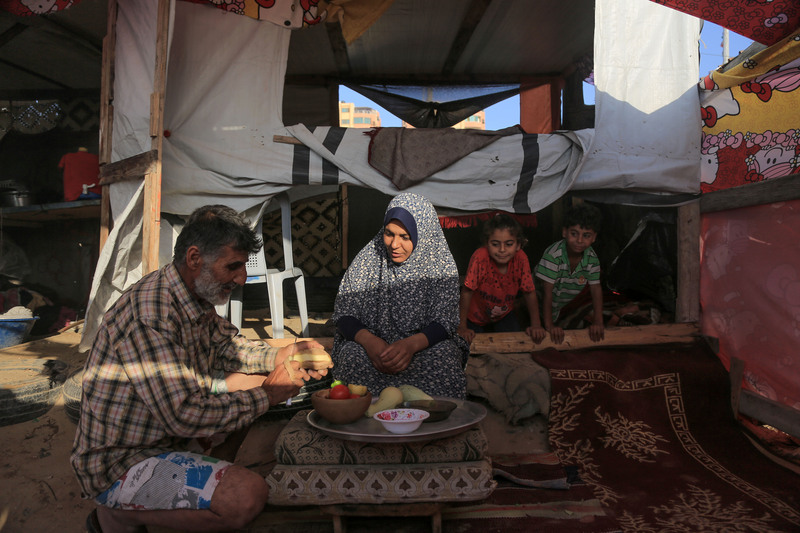 Umm Ahmad is forced to cook iftar (the meal that breaks the daily fast) using scraps of wood that Hani collects from the Gaza city streets — yet Hani and Umm Ahmad gather their children each evening around a table on the sidewalk to break the fast together, as a family. 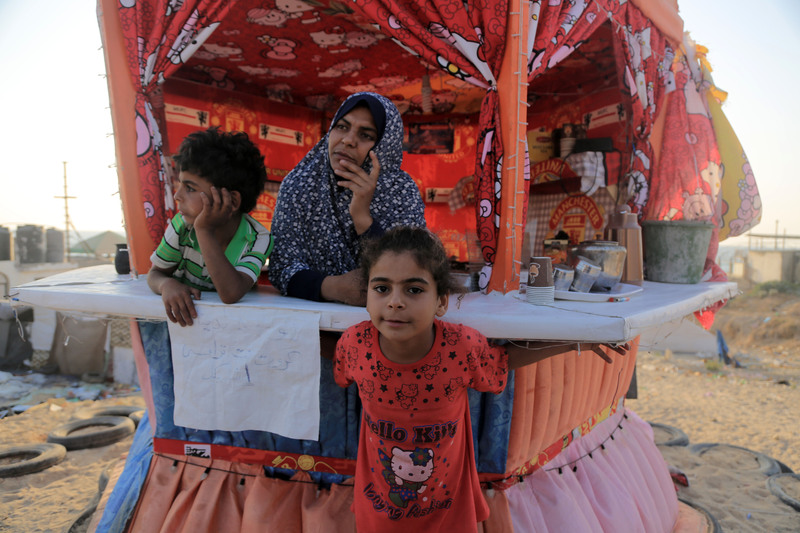 After iftar, they open their family’s tea and coffee shack, in hopes of selling a few warm beverages and earning a few dollars. 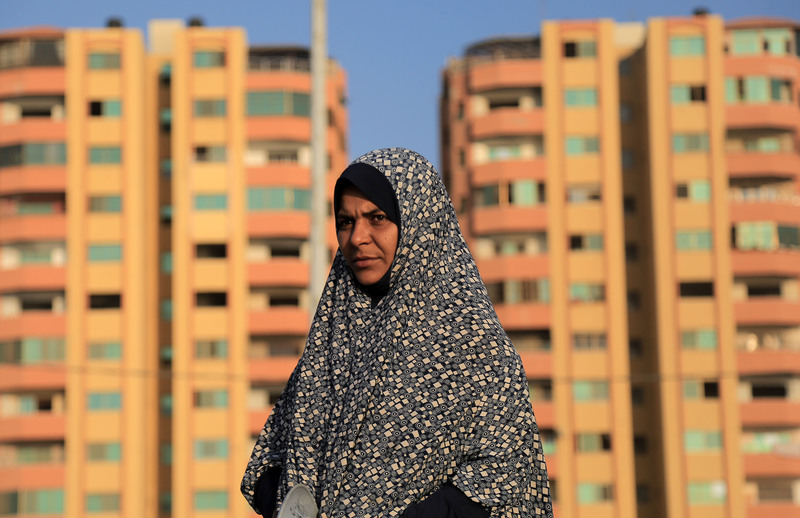 “During Ramadan we wait for those who are merciful to help us,” says Umm Ahmad.